Of the two types of assault cases under Maryland law, second degree is far more common. But first degree assault is charged more often than one would think, and many times these charges are trumped up and not backed by actual evidence. The law defines this offense as causing or attempting to cause serious bodily injury to another person. The problem is that serious bodily injury does not have an exact definition, thus leaving far too much up for interpretation. When police officers or even court commissioners have the freedom to choose a charge (especially one that has a broad definition) they tend to err on the side of including the more serious charge. This unfortunate practice leaves defendants facing not only a felony, but also an exorbitantly high bail, or sometimes no bail at all. Benjamin Herbst is an experienced criminal defense lawyer that has successfully handled numerous felony assault cases. His first priority for clients that are in custody on this type of charge is to convince the judge to set a bail, or to reduce bail to an affordable number. After the clients are released from custody, the immediate goal is to persuade the prosecutor to drop all charges, or at least to enter a dismissal or nolle pros. on the felony count. In Maryland first degree assault is a felony punishable by up to 25 years, and having the charges dropped down to a misdemeanor is an extremely realistic first step. This will not keep the option open of disposing of the case in district court, but will also significantly reduce any type of sentence under the guidelines. Serious bodily injury is not always a requirement for first degree assault. Our state has some of the toughest handgun laws in the country, and these gun laws are often applied to other offenses. The use of any type of firearm in an assault automatically triggers a felony charge regardless of whether anyone was injured. 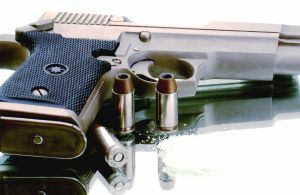 We often see this situation in domestic cases where a defendant does not actually discharge a firearm, but is accused of using it in some other manner during a domestic disturbance. This could include pointing the gun at a person or even displaying it during an argument. First degree assault is also often attached to robbery and armed robbery indictments, as an add on charge. If you or a loved one has been charged or is being investigated for first degree assault it is extremely important to secure an experienced attorney as soon as possible. Defendant’s charged with this offense not only face jail time, but also the stain of a permanent felony conviction. The stakes are simply too high to take your chances without a lawyer with a track record of success. Benjamin is not only committed to fighting for his clients in court, but also to keeping his clients and their families informed throughout the process. He is available to all his clients seven days a week, and will always make time to discuss the case. Contact Benjamin at 410-207-2598 to set up a free consultation.